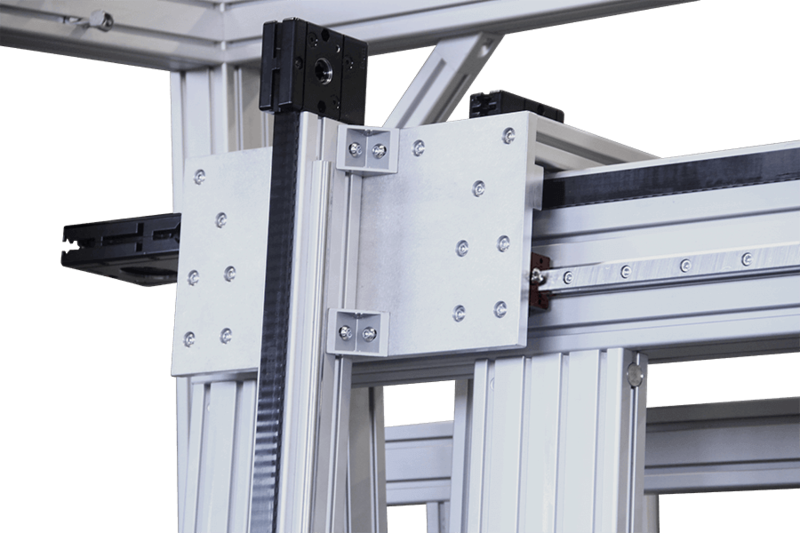 MB Kit Systems' dynamic linear motion selection includes a variety of high-quality extruded aluminum profiles, components and comprehensive linear motion systems. From light duty to heavy duty, with travel of a few inches to over 200 feet (60m), and loads of a few ounces to thousands of pounds. The MB Kit product line consists of a wide range of dynamic components for MB Kit Systems’ engineers to select from when designing a mechanical solution for your next linear motion project. By taking advantage of the high straightness tolerance of the L8 extruded aluminum profiles, Shaft Clamp Profile is used enabling the installation of guide shafts into the standard T-slot grooves. 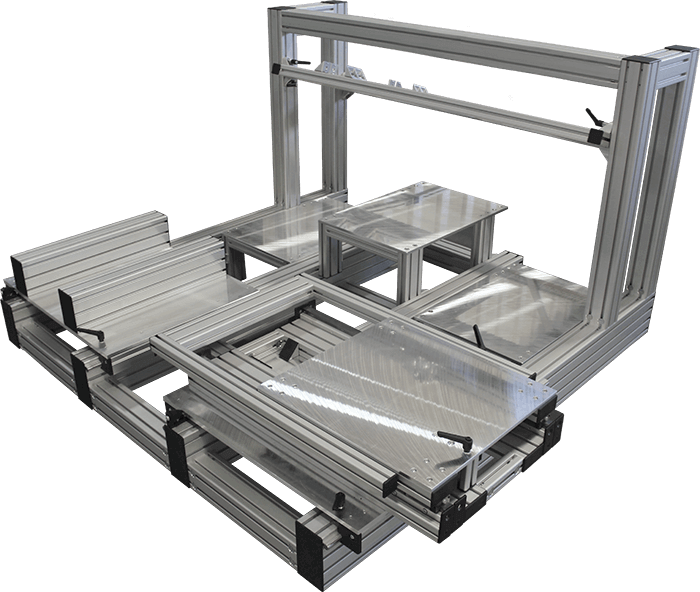 This modularity is not only convenient for those looking to add motion capabilities to an existing frame, though it is particularly useful when designing and constructing large support structures for linear gantry applications. We offer easy belt-driven linear actuator solutions that are ideal for tight spaces without sacrificing precise movement. With traditional belt-driven linear actuator systems and ball-screw linear actuators we can build a tailored linear motion system by utilizing the extruded aluminum profiles and components. We build ball screw actuators up to 110 inches (2794mm) in length, available with 5 and 20-pitch screw. Learn more about our capabilities in belt-driven linear actuators. Belt-driven linear units are constructed from various types of extruded aluminum. They can be designed to work as a singular unit, or can be synchronized to other units for greater load capacity and travel range. L5 profile units can be designed to accommodate smaller loads and shorter movements, using the linear D6 components; and larger loads and longer distances can be accommodated using the D14 and D25 linear component lines, using L8 profiles. These units are end driven using several belt widths. The T10, used for D6 linear for Line 5 profiles; T25, used for D14 linear, T50, used for D25 linear; L8 profiles can be used to create linear units in all three shaft diameter lines. 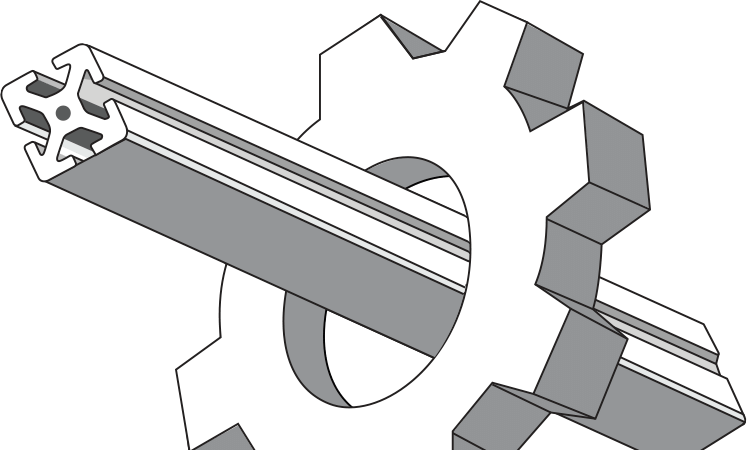 Unit drive elements can be custom machined to various shaft sizes and broaches. An additional option is the VK14 shaft drive. Speeds: Variable Speeds and up to 5 m/s, 16 ft/sec. Ball-screw linear units are generally used in linear applications where low speeds and smaller travel distances are required. They are used in situations where high efficiency, exact precision, and substantial load carrying capacities are needed. Ball-screw units can be used in both horizontal and vertical applications. This unit can be easily combined with linear components and/or customer guides. Drive side of screw can be selected to match as necessary. Speeds: Medium to Lower speeds under and up to 1.0 m/s, 3 ft/sec. 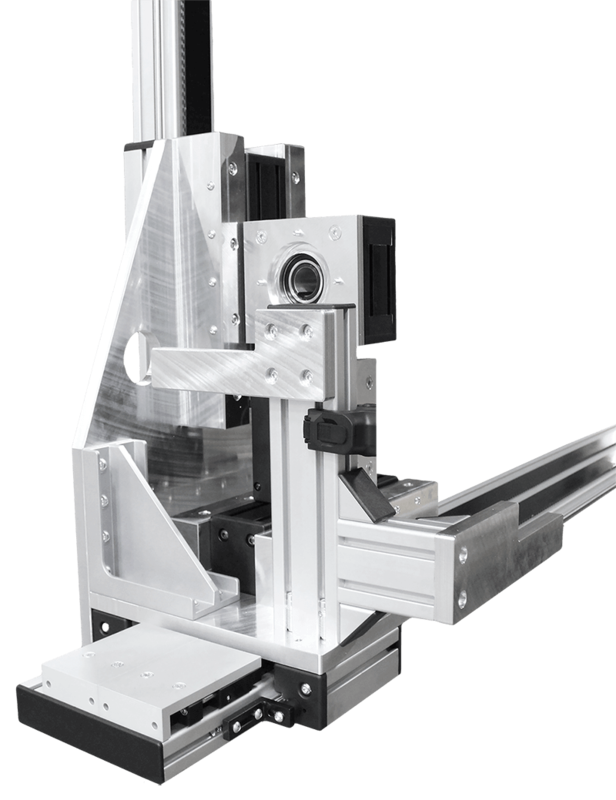 Multi-axis linear systems are generally used in Pick-n-Place situations where materials and components are required to be lifted and moved to another location. These units can range in design for light weight parts moving only millimeters, to more robust components weighing thousands of pounds and moving several meters. Each unit is designed to work specifically to the customers specifications for load, speed, and accuracy. 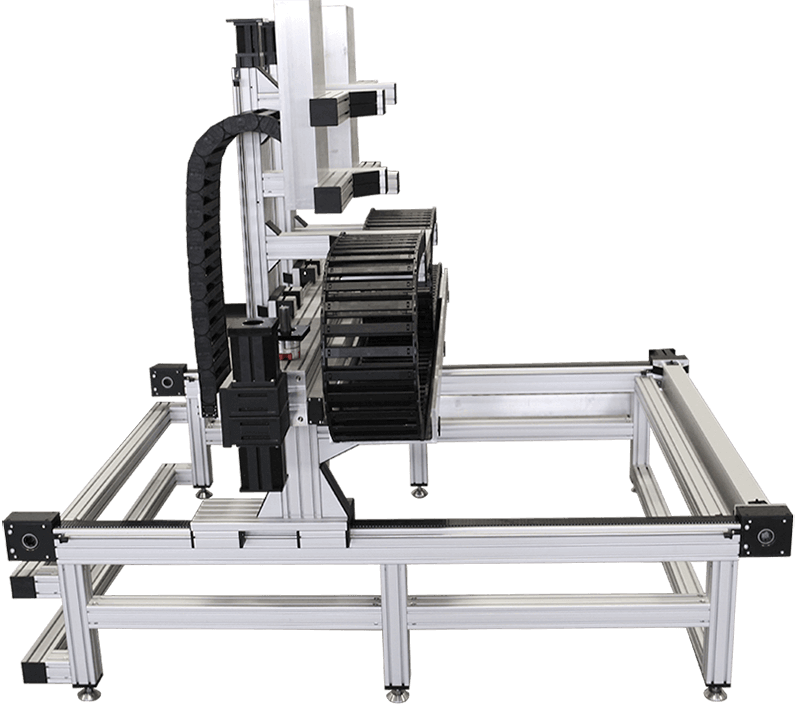 Multi-axis systems can be used with belt-driven and ball-screw linear configurations. Single-axis linear motion systems are also available. MB Kit Systems merges experienced design and high-quality product to build dynamic material handling applications.